This volume gives Asia’s Shakespeares the critical, theoretical, and political space they demand, offering rich, alternative ways of thinking about Asia, Shakespeare, and Asian Shakespeare based on Asian experiences and histories. 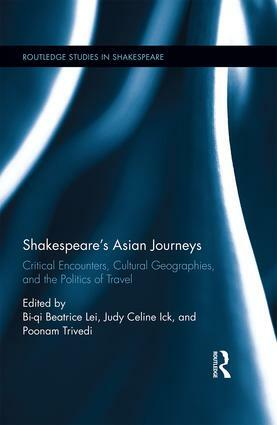 Challenging and supplementing the dominant critical and theoretical structures that determine Shakespeare studies today, close analysis of Shakespeare’s Asian journeys, critical encounters, cultural geographies, and the political complexions of these negotiations reveal perspectives different to the European. Exploring what Shakespeare has done to Asia along with what Asia has done with Shakespeare, this book demonstrates how Shakespeare helps articulate Asianess, unfolding Asia’s past, reflecting Asia’s present, and projecting Asia’s future. This is achieved by forgoing the myth of the Bard’s universality, bypassing the authenticity test, avoiding merely descriptive or even ethnographic accounts, and using caution when applying Western theoretical frameworks. Many of the productions studied in this volume are brought to critical attention for the first time, offering new methodologies and approaches across disciplines including history, philosophy, sociology, geopolitics, religion, postcolonial studies, psychology, translation theory, film studies, and others. The volume explores a range of examples, from exquisite productions infused with ancient aesthetic traditions to popular teen manga and television drama, from state-dictated appropriations to radical political commentaries in areas including Japan, India, Taiwan, Korea, Indonesia, China, and the Philippines. This book goes beyond a showcasing of Asian adaptations in various languages, styles, and theatre traditions, and beyond introductory essays intended to help an unknowing audience appreciate Asian performances, developing a more inflected interpretative dialogue with other areas of Shakespeare studies. Chapter Four: Shakespeare’s Asian Journey or "White Mask, Black Handkerchief"
Chapter Five: "I may be straight, though they themselves be bevel"
Chapter Thirteen: "The Very Basics for All of Us"
Bi-qi Beatrice Lei is a research fellow at the Research Center for Digital Humanities of National Taiwan University, Taiwan. Judy Celine Ick is Professor in the Department of English and Comparative Literature of the University of the Philippines and a part-time faculty member of the Interdisciplinary Studies Department of Ateneo De Manila University, Philippines. Poonam Trivedi is Associate Professor in English at Indraprastha College, University of Delhi, India.